Lazy, hazy recollections of the '60s hold little insight. Near the end of Prime Green, surely the most disappointing book to come out in this young and troubled year, Robert Stone presents an off-hand observation about the merits and uses of nonfiction writing that serves as an unintentional indictment of the very book he himself has delivered into our hands: "The best nonfiction writers -- John McPhee, for example -- create multidimensional characters, and set scenes in dialogue that have their highest accuracy in the reader's recognition of life and speech." Only an inattentive reader could fail to notice that Stone, almost universally regarded as one of America's most significant late 20th-century novelists, has done nothing of the kind in this book, which is intended, as the subtitle promises, as a recollection of the 1960s, when its author was present, either at the center or on the margins, of more than a few key historical, social and cultural events. Instead of scenes, Prime Green offers hastily sketched, half-developed anecdotes that slide into one another like running watercolors, seldom to any point. Instead of multidimensional characters, Stone ponies up fuzzy, declamatory impressions of Ken Kesey, Neal Cassady, Paul Newman and other figures of lasting interest with whom he was acquainted. Instead of giving the reader the means of recognizing high accuracy in life and speech, Stone tosses off a first-draft kind of autobiography that stakes its entire authority on that weakest of all structures, the eye-witness testimony of the author. 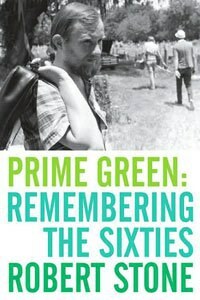 Indeed, Prime Green gives every indication of not having been written at all, but spoken, presumably into a tape recorder, and the result has all the charm and pleasure of listening to a uncle fumbling through half-remembered stories, somewhere south of the third cocktail, at a family gathering. What a letdown, given Stone's stature as a novelist. He was noted for his talent and promise from his very first novel, A Hall of Mirrors (1967), promise that was fulfilled in his best novel, the National Book Award-winning Dog Soldiers (1974). That's not to discredit his later output as a novelist, either. Though he sometimes could be guilty of overreaching in late novels like Outerbridge Reach (1992) or Damascus Gate (1998), he remained a serious and ambitious writer through the end of the century. What's more, Stone is well-positioned to write about the '60s because he was there. A friend of the novelist and provocateur Ken Kesey, Stone was one of the Merry Pranksters aboard the bus Kesey and friends drove from California to New York to visit the World's Fair in 1964, a journey memorialized by journalist Tom Wolfe in his 1968 work of New Journalism, The Electric Kool-Aid Acid Test. Aside from listing the actual people on the bus -- like Woodstock, many who weren't there claim to be -- Stone sheds almost no insight on the event. Apart from telling us that Neal Cassady, a larger-than-life figure famous for his influence on Jack Kerouac, could drive and roll a joint at the same time, Stone's account of the bus trip is woefully brief and absent of anecdote. For a novelist of Stone's proven storytelling skills, he provides shockingly few stories, and those he does give us are frequently ill-considered. He devotes pages to a Greyhound bus ride in which he is menaced by soldiers who don't like his looks, only to allow the whole incident to trail off into nothingness. Uncle loses his train of thought, apparently. Indeed, the best parts of the book are the ones with the least historic interest: His time in the Navy in the late '50s and his tenures with tabloid newspapers in New York before he became a big-shot novelist. "It was the kind of Los Angeles summer day that Nathanael West could describe with such exquisitely turned admiration and loathing." This is lazy writing of the high school variety, akin to saying, "Only a poet could describe..." Nathanael West could describe it, sure, but can Stone? You be the judge: "Sumptuous, sensual, euphorbia-scented. Hummingbirds sipped nectar." Can you picture that? Me neither. If Stone fails as an autobiographer, he could at least step back and offer intellectual analysis of the things he lived through in what was an exceedingly eventful time, right? After all, his novels are the evident work of a very intelligent man. But alas, no. While Stone does clamber atop a soap box from time to time to blow hard about the hippies, or the Tate murders, or Vietnam, these have the air of barroom pontifications heard here not for the first time.